James Sparrow is a self-made multi-millionaire. He bought the formula for an energy booster made from Coyote Grass for a song and turned it into a fortune. Every business he touches turns to profit. He adores his lovely wife, Joyce, but there is a conflict between the two: Joyce wants to have a baby, James does not. As the story opens, James, miserable when yet another long and brutal Midwestern winter descends upon Chicago, longs to flee to Hawaii. But this year, Joyce is ill with what appears to be the flu and is unable to travel. An unexpected phone call from his cousin Liz, who lives in James’s hometown of Looseleaf, North Dakota, puts the Sparrows’ holiday plans --- whatever they might or might not be --- on hold as he learns that his Uncle Earl is dying. He hopes to make a quick visit to his uncle’s bedside and then continue on to the warm ocean breezes of Hawaii. 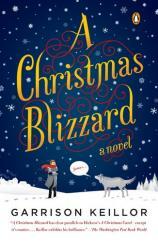 But a raging blizzard keeps James and his flight crew grounded in Looseleaf. Stuck in his old hometown, James has memories of bitterly cold winters and Christmases that were anything but merry and bright. Then, too, there is that neurotic obsession and downright fear he must deal with any time he encounters winter weather --- a secret in the back of his mind that nags at him relentlessly. James decides to hole up in Floyd’s ice fishing shack out on frozen Lake Winnesissebigosh. Floyd, being deceased, no longer uses the shack, but his widow, James’s cousin Faye, has the shack hauled out onto the frozen lake each winter anyway. James soon begins to experience encounters of the mystical kind. His first visitor is a gray wolf who has come not to attack him, but to guide him. It turns out to be Ralph, a boyhood friend who drowned while duck hunting at the age of 25. During the Christmas moon, the wolf has the power of speech, so Ralph and James are able to converse. James then finds himself in the spirit world, hassled by a woman with big, black hair. She gives him a 24-hour pass to make his peace. Next, James visits a coffee shop in San Francisco without ever really leaving Looseleaf. Finally, he encounters a wise old Chinese man who reminds him of the good he has done since he came home. Cousin Liz, a kooky woman who heads the local citizen militia, Possum Comatosis, invites James over to her fishing shack. She cuts a hole out on the frozen lake and jumps in naked. Then they enter her shack, which is basically a dry sauna. James has been to several therapists, but none were able to cure him of his neurotic obsession. So how could he even entertain the idea that Liz might be able to help him? 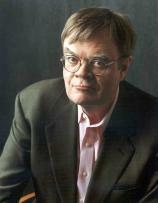 This unique Christmas fable will not seem strange or too unusual to Garrison Keillor’s many fans who have come to expect the humorously unexpected from this very talented and prolific writer.